The view of where we started our workshop just days before. Photo: Eric Matt via Facebook. 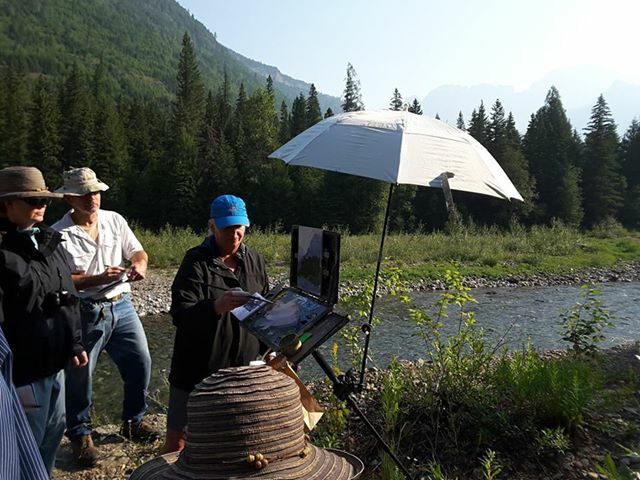 Many times I’ve found myself in discussions about what constitutes the legitimacy of Plein air. That is not what this post is about (but watch for one coming out soon). Instead, I want to talk about the overwhelming sense of being part of a place, having it in my heart, and connecting to it in a deeply spiritual way, just because I painted there. It happens all the time. I feel that small bits of my soul are already scattered all over the earth. Humbling, to be sure. All of these places, every where I have painted, have given so much to me. I’m eternally grateful. What have I given in return? Class at Wheeler Cabin on the first day. (not-pictured, Pamm Ciupa--taking the photo of course). Devastation and loss strikes close to home. No, not here in Charlotte, Tennessee (at least not today), but in many of the locations I’ve visited and been allowed to express my interpretation on canvas. Every one of them feels a little like home. This year alone, places who have faced loss and devastation due to fire include dozens of areas in California, Washington, and Oregon; in Canada and Montana; and in Eastpoint, Florida, just to name a few. In fact, fire and hurricanes hit beautiful West Maui just a few weeks ago. I could go on and on, particularly if I look back a few years. Many of these fires, hurricanes, volcanoes, earthquakes, and floods took lives as well as land, homes, and the walls and frescos of churches dating back to the 13th century near our place in Italy. These disasters have no preference or bias. They change the lives of all people, regardless of race, economic class, political stance, or gender. The truly freaky part of this to me personally, is that many of the losses have occurred just after I left the area. That is the case of a recent fire in Glacier National Park. If you have read my story about why Glacier is so important to me, you will understand why this affected me so deeply. A few weeks ago I was teaching a workshop there for the Hockaday Museum of Art. Working with the Glacier Park Conservancy, the Museum managed to gain permission for the workshop to be held inside the park. Our group was the lucky recipient of two entities working together for the good of all. The main Wheeler Cabin is on the National Register of Historic Places. Based in West Glacier at the historic Wheeler cabins, we began the first day painting on the property which had been in the family since 1916. Ironically, the main cabin had burned in 1941, but was rebuilt along with four others on the property. In 1947, Lulu Wheeler, the wife of U.S. Sen. Burton Wheeler, made a deal with the Park Service to give the land and buildings to the government when the last of her six children died. In 2014, the last, Marion Wheeler Scott, died at the age of 89. One of the students in my workshop is married to a descendant of the family, and shared her personal stories of summers spent there. Together with Education Director from the Hockaday, Kathy Martin, we also learned some about the hopes and dreams for the future, now that the National Park Service is in control. A favorite painting spot I shared with the class. The distant mountains are obscured due to smoke from fires in neighboring states. Throughout the workshop, we painted several other locations near and around Lake McDonald, and ended our last day’s wrap up back at the Wheeler cabin. The weather was perfect, but the distant mountains were in and our of obscurity due to smoke from fires as far away as California and Oregon. It was in the air. We could smell it, and were mindful of those who were in the midst of it. We confirmed with the Ranger... this is indeed a grizzly print. It is extremely rare for my husband to get to travel with me when I’m working. He loves to hike, and we made arrangements for him to come out to Glacier after the workshop to hike, attend the Museum opening, and for me to share MY Glacier with him. A grizzly print prompted us to retreat on one of the hikes. It was a quick trip for him, but we made the most of it. I'm so glad I took him to see some of the places we painted. 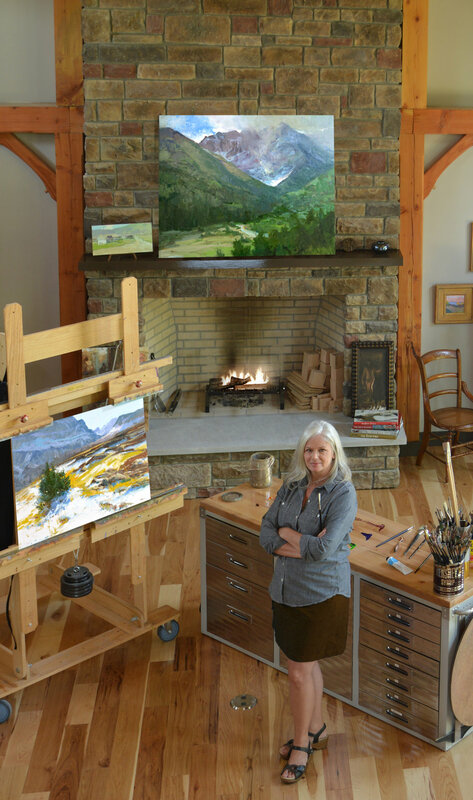 Gail holding the demonstration painting she purchased. Everything behind us burned. Before the fire at McDonald Creek. Fire coming ashore at Lake McDonald. Just about the time Mark’s plane landed back in Nashville, a lightening strike ignited a fire near Lake McDonald. I was in route to Yorkshire, England to teach another workshop. By the time I connected to WiFi, several students had emailed images of the workshop. Two, local students, sent images of the fire that totally destroyed the exact area in which we had just been painting. One of those students was Gail, the wife of the descendant mentioned early. She sent a pic of her standing with me in front of the cabins and forest. She is holding the demonstration painting from the forest day, her new purchase. She also sent a picture of the fire coming along the shore toward the area, which it did soon after this photo was taken. Char. 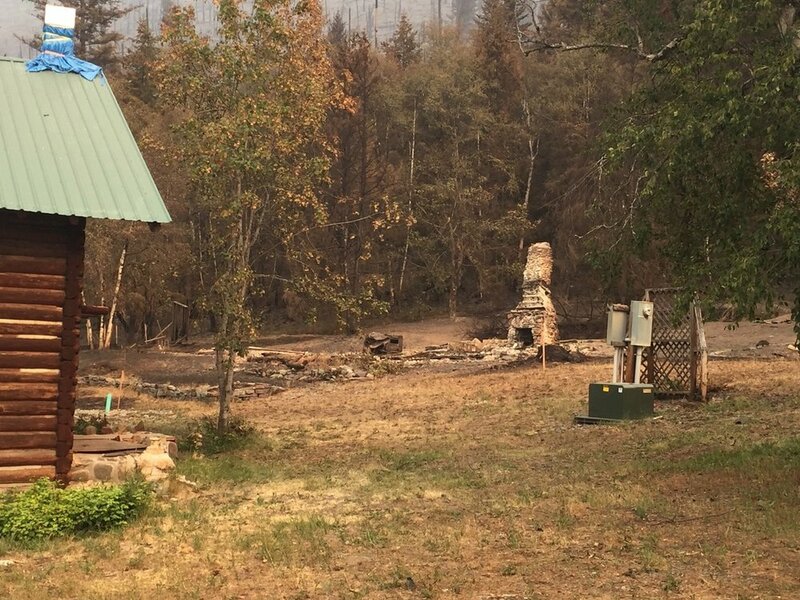 The forest and four of the five buildings at the Wheeler cabin property, gone. The large, main cabin sustained damage, but was saved. All that is left of one of the four cabins consumed by the fire. Updates on this particular fire can be found here. This is an awfully long post to basically say, there are no words. It’s a soul thing. Every place is at home in my heart, and my heart is full. P.S.— A special thanks to all of you who donated to the people of Eastpoint, Florida following fire there in June. Here is an update on how your donations have helped.